The Pictures Tell the Story…. A picture is worth a thousand words? It’s time to share with you some pictures from the past. The first one is from Life Magazine’s final issue on December 29, 1972. The heading read “Skyjackers Who Were Tried and What They Got” from a two-page spread with that caption “The Fruitless War on Crime in the Air.” Photos of all the skyjackers caught in 1972 appeared there. It showed that Robb Heady had gotten a 30-year sentence for his crime. The next photo shows me with Robb in his maroon-colored sports jacket on the one day they let him come home for prison for his brother’s funeral. Sadly, his brother passed away a year after Robb’s skyjacking, which I write about in my book. You can see how hard I was trying to smile for the camera but it was all I could do to hold back the tears. We had just a few hours together that day before they whisked him back to Lompoc Federal prison in California. Then there are photos of our wedding on October 7, 1978, and just afterwards when we had changed into our traveling clothes for the honeymoon, as we were standing in front of Robb’s parents’ house in Reno. Finally there is a picture of me sitting in the old Chevy we took on our honeymoon in Oregon….sitting right there on the one-land dirt logging road I’d managed to get us lost on! 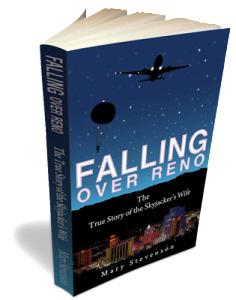 My book Falling Over Reno: The True Story of the Skyjacker’s Wife explains all these adventures and misadventures. Such memories wash over me as I look at this photographs today. Just click on each link below to see these scenes that I have described.